With its bright color and social behavior, the Northern Cardinal is a favorite among frequent visitors to bird feeders. That's why it's no surprise the No/No Red Cardinal Wild bird feeder is particularly popular. A No/No feeder is a truly special product, one built by a company committed to making bird feeders without decomposable wood or plastic -- bringing you an extremely durable and long-lasting bird feeding experience. No/No, which is so named for having no wood and no plastic in its feeders, puts that philosophy into action with this feeder, which is made entirely out of metal. That means there's nothing to rot or break off. This charming red feeder will stand out against the background of your yard while attracting a wide variety of bird species. Nearly impervious to squirrels and weather, this No/No feeder collapses flat for easy shipping and storage and is even dishwasher safe! 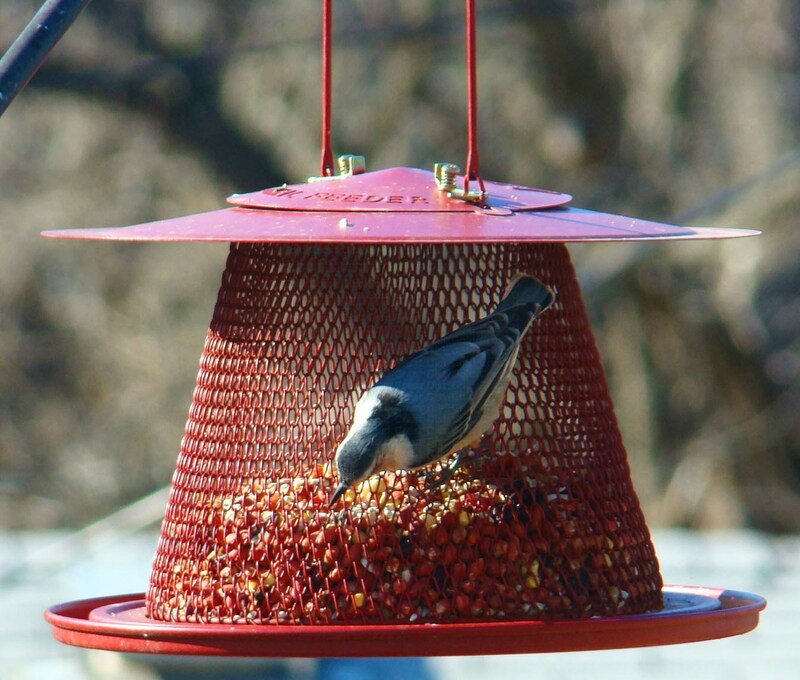 Holding up to 2.5 lbs of seed at a time, the feeder is big enough to accommodate 15 to 20 birds, which means you don't have to worry about setting up multiple feeders or constantly refilling it. This is exactly what we were looking for. Now we are enjoying even more cardinals in our yard. 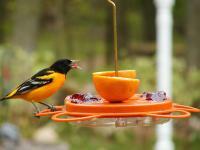 They are great for the birds have to fill feeder at least once a day. Works exactly as advertised. Cardinals started showing up within a few days. The Cardinals like the feeder. My problem was the squirrels kept getting into the feeder. I changed the seeds to Safflower seeds and the squirrels don't seem to like that as much. I love it. This is my 2nd one and the Cardinals do come to it. This bird feeder is perfect! The birds love it and they can't waste the sunflower seeds. I find this to be a fine product. The only problem is that the bears also like this bird feeder. After they attack it, the top is usually bent out of shape! So I order another one!!! I had it sent to my mother and she absolutely loves it! The birds love this feeder and I like the fact that it holds so much seed that I am not continually filling it. I am glad that I made this purchase for myself. I bought the No-No red cardinal mesh bird feeder as a gift for my sister who loves feeding and watching birds. The day before her birthday I was at her house and saw another No-No green feeder. She was so happy and thrilled to get another one!!!! Terrific....The first feeder in a long time that the Squirrels and Raccoons haven't been able to destroy and the birds are at home with! This is an excellent sunflower seed dispenser. It is easy to refill. I hang it in my yard all year. The squirrels love it, too, so it must be placed where they can't get to it. I fill it with safflower seed and the squirrels don't bother with it. I get a cardinal pair on this feeder everyday. This is sturdy and easy to refill. All of the perching birds use it: chickadees, titmice, finches, nut hatches. Our long-time resident pair of cardinals spend a lot of time at it. We wanted to attract cardinals to our yard throughout the winter. This feeder, together with the recommended seed, did exactly that. We could not be more pleased. The good design allows quick and easy refill. I am completely satisfied with this transaction and my purchase. The feeder arrived in a timely manner. 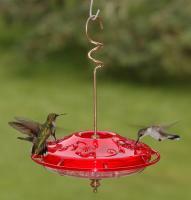 It is the best feeder I have ever used. The birds love it! It does keep the squirrels out! I had fun though watching them trying to get at the seed. My grandson enjoyed it too! The birds love this feeder. I like this model compared to the last similar model that I owned since it has a complete bottom perch so the seed does not fall on the ground and the birds love to eat there. I highly recommend this feeder! It is well built to last. I like the feeder a lot and it is easy to keep clean. It is perfectly designed with the least amount of waste for my cardinals, and it is impenetrable for squirrels. This is an excellent quality and price. I have already assembled it and just needed to put the seed in. My cardinals loved it from the moment I hung it. Top of the line feeder. No molded seed from the rain, holds peanuts well too. Nice design. I'll take one more! 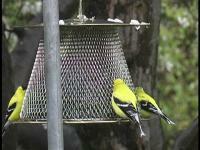 We fill the feeder with safflower seed. It holds a large volume of seed and there is room for more birds perch and feed at the same time. I have enjoyed this feeder. It is very colorful and easy to fill and maintain. Very nice birdfeeder, easy to clean, many birds use it. However, I would not buy a "red" bird feeder as it does not enable you to see the Cardinals will need to place very close to my patio. Really like the feeder, but it is not squirrel proof. We have little gray squirrels here and they manage to get on, wrap themselves around the 'seed cage' and munch away. The birds love it! Especially the tufted titmice, chickadees, cardinals, nuthatch, woodpeckers. So all in all I would say it is a success. Easy to fill and attracts cardinals as well as other song birds. My wife liked it. We have several variations of bird feeders that are supposed to be squirrel proof. Time will tell, So Far So Good. It is unusual compared to what we can find in our area so that was good. I am going to purchase another one soon for my son who also has bird feeders in his back yard. This bird feeder is just fine, but wish I had bought a squirrel proof one to start with. So I will buy another and the first will have been a waste of money. It is easy to fill and attracts the wrong birds, but an OK product. Bought this for a friend. They love the color red but haven't had much activity yet. They just need to give it time. I would give this feeder a 5 rating but the darn squirrels get into it all the time. I didn't realize how clever squirrels are. They are relentless. I love the feeder - the red shows up so well and at night the little birds are all over it. The birds love it! The only problem is the floor of the feeder is flat. The birds eat the food from the sides and leave a mound in the middle. The floor needs to be convex to force the food to the edges. Other than that, I am very satisfied! It was a gift to my adult daughter in Lake St. Louis and she likes it. The squirrels knocked it down during my visit and nothing broke. That's good! It seems to work well. Cardinals are starting to discover it and eat in pairs. I have not seen any cardinals at this feeder because there are too many red winged blackbirds. Isn't there something that can be made to deter these annoying birds that chase other birds away. They say that blue jays are the bullies. That's not true they do not sit at the feeder for a long time. Thank you. I was hoping it would be squirrel-proof, but it doesn't seem to discourage them at all. The birds haven't had a chance. I had high hopes, but have taken several pictures of the squirrels on the feeder. It is made well, but not really a "foil" for them. I like the look of this feeder, but the only animals that have found it so far are the squirrels who find it very comfortable! So I am not too happy with it. Cardinals will not use this feeder. However, sparrows love it.